Hyperbaric Oxygen Therapy (HBOT) delivers oxygen, under pressure, to tissues in the body. This action increases the levels of oxygen in the plasma, lymphatic fluid and cerebrospinal fluid which stimulates healing. Increasing oxygen levels combats microbial infections by activating white blood cells. This helps to rid the body of bacteria, viruses and yeast. It also helps reduce inflammation, oxidative stress and free radical damage while simultaneously stimulating blood vessel and collagen formation. In addition, there are many animal and clinical examples showing the benefits of hyperbaric medicine in promoting neurological recovery through axon regeneration following nerve trauma. Large chamber fits multiple people for a very comfortable and fun treatment. The twins loves it! What conditions does hyperbaric medicine treat? What makes our hyperbaric chamber special? Multi person chamber. Cost of treatment is reduced when sharing the chamber. Can bring electronics such as phones, ipads and computers into the chamber. Bring headphones and listen to your favorite music. Added oxygen concentrater delivers extra oxygen to the tissues. 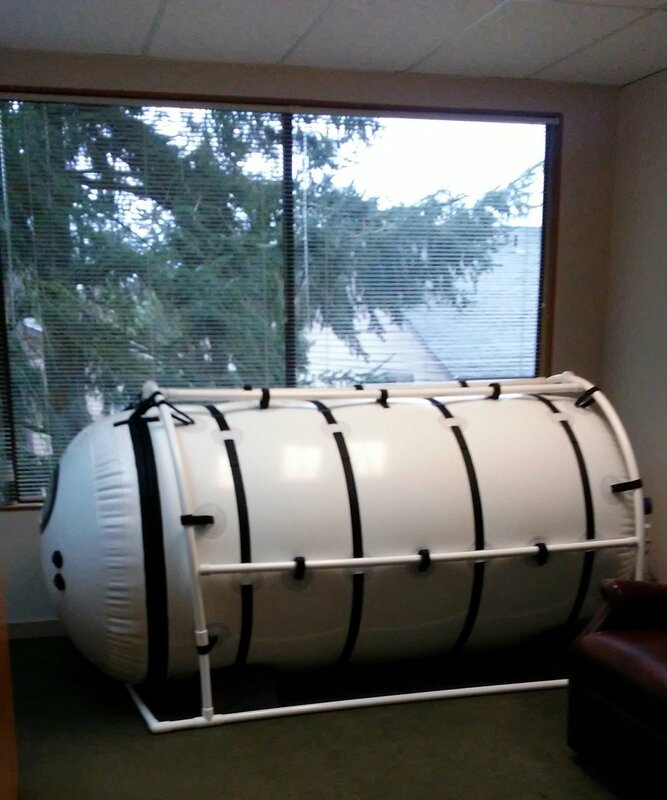 Our hyperbaric chamber fully inflated. Dr. Morlan discusses the use of hyperbaric medicine to treat the effects of traumatic brain injury and concussion. Dr. Morlan discusses how hyperbaric medicine can benefit those with dementia. Dr. Shober explains the benefits of hyperbaric medicine and how it works. Two-year-old Eden Carlson made a full recovery after a drowning accident left the child brain-dead. After dozens of oxygen treatments at Louisiana State University Health's hyperbaric chamber, the tot is walking, talking, eating and playing. Witness positive results treating autism with hyperbaric oxygen therapy. Parent's testimonial how Hyperbaric Oxygen Therapy (HBOT) has improved motor skills, speech, awareness, sociability and eye contact in their autistic child. Up to 20 years after suffering a stroke, patients in Israel are reporting remarkable improvements in brain function with calibrated oxygen treatments inside hyperbaric chambers. While treating stroke patients with hyperbaric oxygen is nothing new, the fact that it can be effective after so many years is an exciting new development according to specialists at Assaf Harofeh Medical Center.